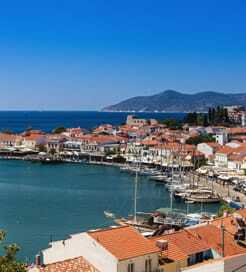 There are 4 ferry routes operating between Cyclades Islands and Samos offering you combined total of 13 sailings per week. Hellenic Seaways operates 4 routes, Mykonos to Karlovassi runs 6 times per week, Mykonos to Vathi about 1 time weekly, Syros to Karlovassi about 4 times weekly & Syros to Vathi about 2 times weekly. As the frequency and duration of crossings on some routes varies we would advise that you do a live search for crossings from Cyclades Islands to Samos to get the most up to date information. 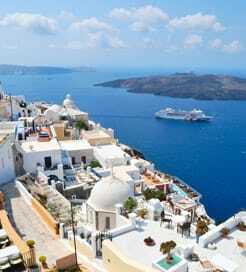 The Cyclades Islands are a Greek archipelago in the Aegean Sea, southeast of the mainland. Whether you’re looking for an action-packed adventure, romantic retreat, or blissful getaway, the Cyclades have it all. Also, not only are they stunningly beautiful, they deliver on the cultural front too, boasting flourishing food scenes and a rich history. You’re never short of fascinating things to see either. Delos is the legendary birthplace of Greek deities Apollo and Artemis and claims many archaeological sites while the world-renowned beaches of Mykonos are the perfect places to unwind after a day of adventure. When it comes to exploring Greece and her islands, travelling by ferry is a quick and convenient way to get around. From the Cyclades, there is a vast network of ferry routes available to the surrounding Greek islands and the mainland, as well as numerous crossings between the Cyclades group itself.